Flying? Air Conditioning On A Flight Needs To Be ON! Jet setting across the world? If you have been enjoying the summer sun but still feel like you need a break from the UK then make sure you read this. In recent years have you noticed that air conditioning on planes seems to be getting cranked all the way up? (or down depending how you look at it). The average airplane maintains a cargo and in cabin temperature of 18c – 22c in flight. This is no lower that a standard setting on commercial air conditioning or residential air conditioning. However, while in a seated position (still in your Hawaiian shirt and extra short shorts) this has most passengers feeling too cold. Tight confined spaces and lots of bodies, coughing and sneezing with no venation.. Air Bourne viruses and sickness are warded off by the cloak of cold air coming in from air conditioning vents in planes. If you are dressed correctly, using the air con can actually stop you getting sick rather than making you catch a cold. In an enclosed cabin, someone that may be carrying a life treating illness can contaminate your air. This can be from as much as up to 5 rows away from yours. Unfortunately its not the plane that is dirty but sick people that make us ill on flights. Therefore, air conditioning could be saving your life. So instead of shivering on the flight, wrap up warm or ask for a blanket. Deep breathing can also help with feeling warmer. 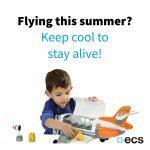 Fancy an extra plane air conditioning fact? Most commercial flights average a 35000 ft flying height which is over 5000 ft higher than mount Everest. The higher it gets the colder it gets. With external temperatures below -50c the air conditioning is actually maintaining a comfortable in cabin temperature in flight. (…unless you are a stow away..then you are likely to freeze on the wheel arch).